© Copyright 2015, Paul M. Chenoweth, Nashville, TN USA. All rights reserved. It looks like it is back to square one on this project. Attachments to this piece created some sizable air pockets that I did not pierce with a needle to allow air to escape...so, it didn't, and this is the result. It is quite a mess. Thankfully, it is not a mistake that I make often. Ohhhhhhh NOOOOOOO!!! How super LAME! 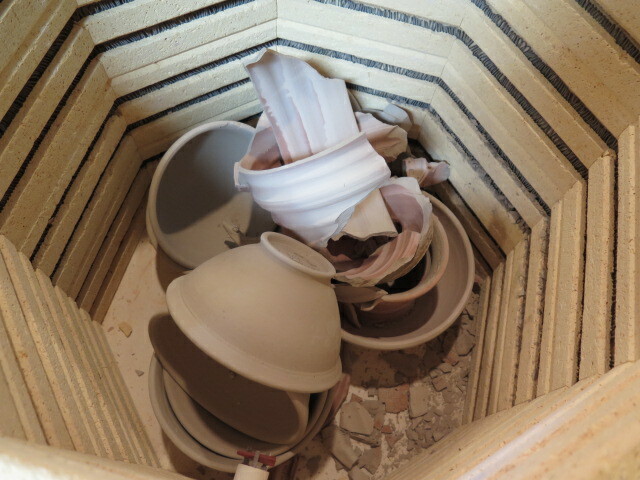 Man, those kiln gods are not known for mercy...you worked so hard on that! This is my mistake, Guinea...'completely preventable had I not been in a hurry (or having a 'senior' moment). The pieces have been retired (trashed) and the kiln is all vacuumed out and ready to roll. from th epastt, it is more likely to be moisture than air which blew the tornado up....or a faster than it liked firing..
"The key to everything is patience. You get the chicken by hatching the egg, not by smashing it."